ESO Supernova Exhibition — How are galaxies distributed in space? How are galaxies distributed in space? Galaxies are clustered into groups. Galaxy groups form larger clusters, and clusters are part of huge superclusters. In between clusters and superclusters are vast cosmic voids. 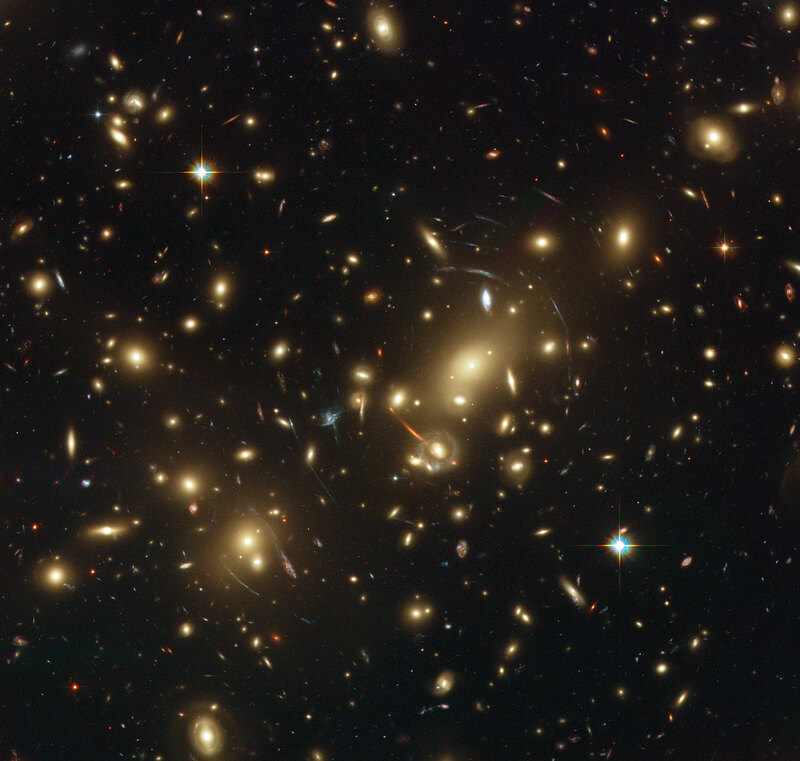 Rich field: Abell 2218 is a rich galaxy cluster composed of thousands of individual galaxies. It sits about 2.1 billion light-years from the Earth. Galaxy clusters are among the largest structures in the Universe. 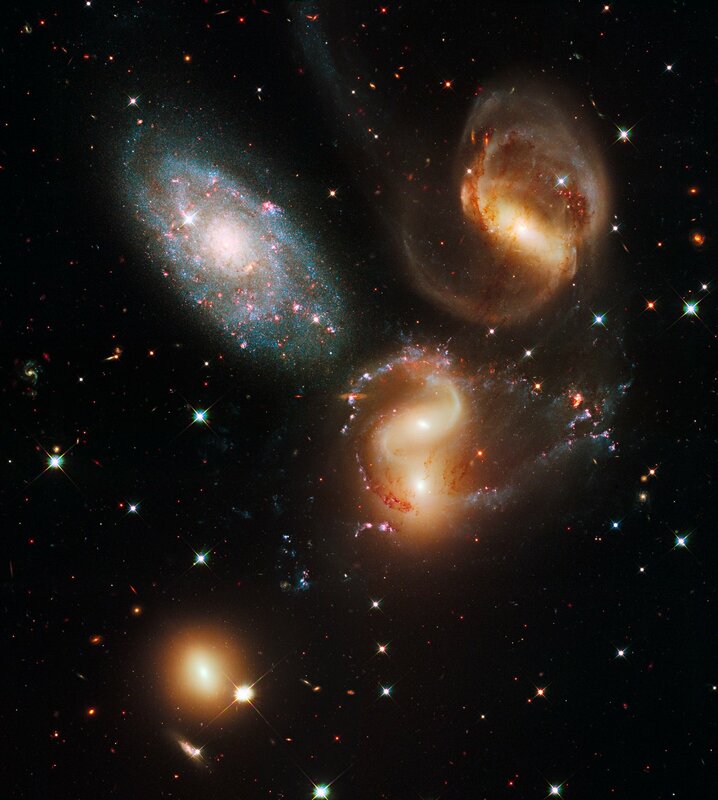 In front of a group: Stephan’s Quintet is a compact group of galaxies. 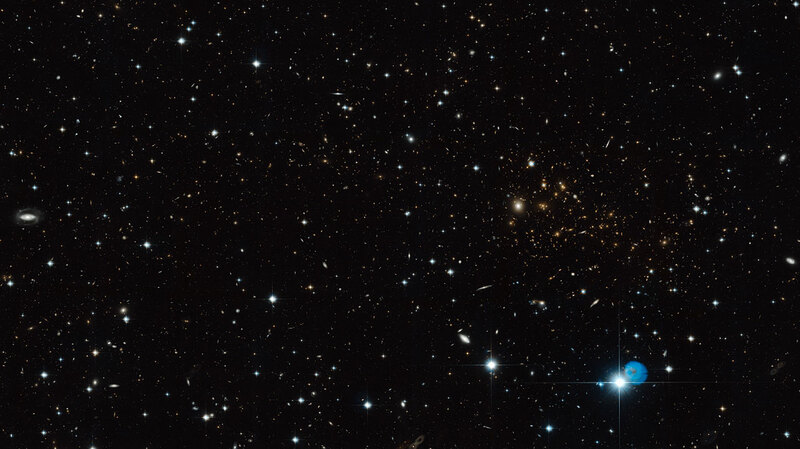 The bluish galaxy in the upper left, however, is a much nearer foreground galaxy. Our Milky Way, the Andromeda Galaxy, and the Triangulum Galaxy, together with dozens of dwarf galaxies, make up the Local Group. Along with numerous other galaxy groups, the Local Group is part of the Virgo Cluster, which contains almost 2000 galaxies. The Virgo cluster, in turn, forms the core of the Local Supercluster. Superclusters can span up to 900 million light-years. Our Local Supercluster is relatively small, but belongs to a larger region called the Laniakea Supercluster, over 500 million light-years in diameter. Cosmic structure: The large-scale structure of the Universe consists of numerous superclusters of galaxies, each containing many clusters and smaller groups (artist’s impression). You know the sequence: Germany, Europe, Earth, Solar System, Milky Way? Well, it goes on: Local Group, Virgo Cluster, Laniakea Supercluster. This is your complete cosmic address!